As well as the prints that I made in the workshop onto fabrics (the ones i mentioned in my very first blog post), I have also been practicing with my embroidery techniques. 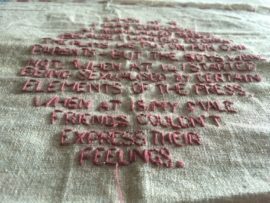 I practiced on a medium sized embroidery hoop, where I wrote part of Emma Watson’s speech in string. I really like how she has incorporated issues for both sexes and the different issues each gender faces through different years in their childhood. A tutor suggested that I write something in a similar format, but so it applies to my life, so it is personal to me. I’ve been thinking about things I could write. I work in a pub in a small village in the middle of nowhere, and the comments I get from the middle aged + men in there would be perfect for this sort of thing. I don’t want to waste this embroidery quote, despite the fact it was only a practice piece. I’m not planning to sew my previous prints on fabric onto my paintings, so I’ve decided that i’m going to make a separate couple of artworks which features all of my quote artworks. These separate works can hang along side my portraits in the degree show. 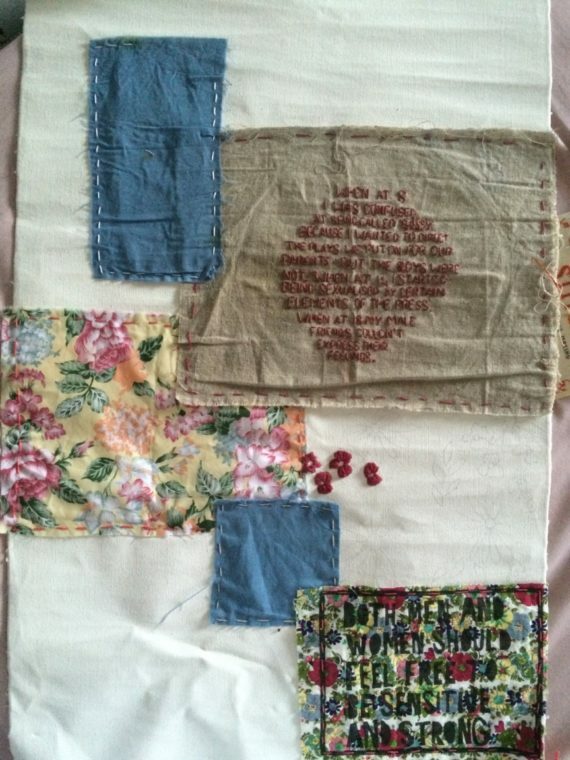 So far i’ve incorporated one of my floral fabric prints, alongside another floral fabric, and a plain blue fabric. I added in my practice embroidery, and then started embroidering flowers over the top. I haven’t tried to make these flowers particularly suggestive like the ones in Georgia O’Keeffe’s work, but I am planning to add in a few that could be seen as vaginas. I love the variety of colours present in this work, but I hope it doesn’t distract from my portraits. I plan to use a similar colour scheme in my portraits ; bright and vibrant, so maybe this won’t be such an issue. Reading through Emma Watson’s UN speech on gender equality, i am glad to see that she has not only focused on the problems females experience with being sexualised, but also the problems males face with sensitivity and the pressure of being a ‘man’. 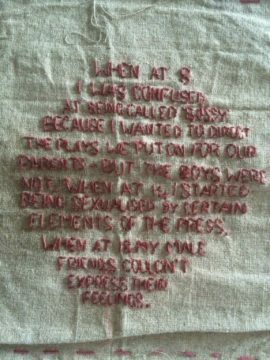 I not only want to show the issues around how females are represented in the media, but I also want to show the issues around men being unable to express their feelings. There are so many more quotes that I could look at too, but I feel these ones really hit home and ensure that it is understood that gender equality is a problem for both sexes.